This is the story of three little princesses, a dastardly (yet very cute) squirrel, a wicked queen and an even wickeder king. Once upon a time (the end of October, actually), an adorable little squirrel decided to find a new home. The weather was getting chilly and he didn't want to live at the top of his perfectly good tree anymore. So, he set out to find something a little warmer. And what a lucky rodent he was, because he found a lovely little opening in the roof of a cute little cottage on the hill. He especially liked all of the soft and warm insulation and set about to making his new nest immediately. Meanwhile, the wicked queen, who was not yet so very wicked, was downstairs sewing a dress for her eldest princess, and she heard the scritchy-scratchiness of the squirrel going in and out of his new nesting place on the roof. And later, her three princesses told her all about the sounds of the animal in the ceiling of their royal playroom as they watched their beloved Barbie and the Magical Castle movies. The even wickeder king went to investigate and verified that there was indeed, a dastardly squirrel living in the royal playroom ceiling. The wicked queen immediately began to call animal-control-type businesses all throughout the land, and was very dismayed to learn that almost nobody dealt with dastardly squirrels. They didn't even deal with nice squirrels, in fact. After several hours of near-fruitless searching, she was finally given the phone number of somebody who promised to deal with squirrels. So she left a message. Meanwhile, the very cute, but dastardly squirrel was busy storing all of his nuts and acorns in the royal playroom ceiling. As he worked, he began to poke holes through the drywall, and sometimes his nuts and leaves and even some insulation fell onto the three princesses, who thought this was absolutely adorable. They began to consider Mr. Dastardly their pet, and loved to watch for him out of the kitchen window as he scampered around gathering his winter food. The wicked queen and even wickeder king did not think holes in the ceiling were adorable, or even cute. In fact, the holes in the ceiling made the king very, very angry and the queen very, very anxious. They were very relieved when the critter control man finally called. Except, Mr. Critter Control lived very far away, in an entirely different kingdom and wouldn't be able to come for a week, or maybe more. 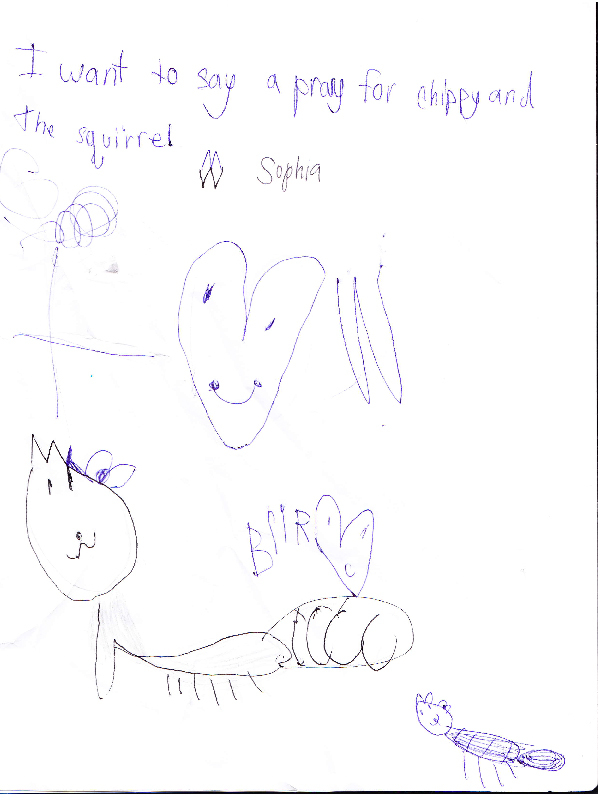 And the squirrel continued to make his nest, poking holes and enrapturing the three little princesses even while he enraged the king and made the queen begin to bite her nails. Finally, the day came when Mr. Critter Control came to their cozy little cottage on the hill and looked into the matter. He verified that the squirrel was living there, although, really, no verification was needed, and also delivered the very unwelcome news that bats--lots and lots of bats--were living in the ceiling of their hundred-year-old cottage. He told the king and queen that he would be happy to deal with both problems, for a very large sum of money. Now, I must mention, that this king and queen (wicked only because they didn't approve of squirrels sharing their living quarters) were not the kind of king and queen that were wealthy. And the very large sum of money that Mr. Critter Control wanted was almost as much as the amount they paid every month to live in their sweet little cottage. But, it had to be done, and nobody else could--or would--do it. Mr. Critter Control left with the promise that he would come again soon, and the king and queen set about to life as usual, smiling again because they knew that the dastardly squirrel would soon be gone. A week passed by. No Mr. Critter Control. Another few days. Still no Mr. Critter Control. Finally, after nearly two weeks of waiting, he came. And he climbed all over the roof of the little cottage and found every nook and cranny through which a squirrel or a bat could climb, and sealed them off with magic wire and a guarantee that no little critter would ever find its way in again. And true enough, the squirrel could not get back in that night. But he diligently tried, for this was a very persistent little squirrel. The three little princesses often heard him scritching and scratching and chewing and trying his mightiest to get in. They looked out the window as snowflakes began falling from the sky and worried at how the adorable little creature would possibly survive the winter. They drew pictures reminiscing about their poor, freezing, little pet. But most of all, they cried and cried (the eldest crying the very most) and they were sadder than three princesses ever should be, as they watched the squirrel sit in his tree and shiver in the cold. "Well, he can't live in our house!" said the wicked queen. And the even wickeder king went outside and threw snowballs at him. "You can pray for him," the wicked queen told her daughters. "Heavenly Father will take care of his creatures." And so, that night they began to pray for the squirrel. And lo and behold, after a few days, a miracle happened. The squirrel got back into the ceiling of the royal playroom. To the princesses, this was wonderful news! 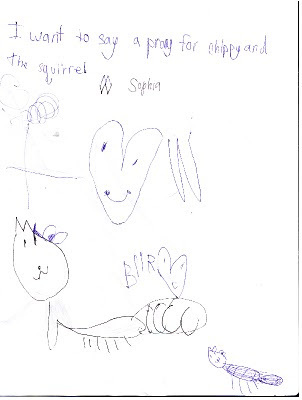 The squirrel would live happily ever after, indeed! And, of course, so would they. But to their wicked parents, this was all too much to bear and they immediately rang up Mr. Critter Control, who promised to come the very next day. But he didn't. And he didn't come the next day or even the next one after that. He did come the next week, while the wicked queen was at work. This was a good thing, because she was getting wickeder all the time as far as the dastardly squirrel and Mr. Critter Control were concerned. For together, they had already blown the Christmas budget and were steadily ruining the ceiling in the royal playroom and the queen could only think about what it would cost to make repairs. All was well, though, for Mr. Critter Control found where the cunning animal had gotten back in and he made sure to seal it all up good and tight. The princesses? Well, they are learning that perhaps having parents who are happy is a better thing than a squirrel all cozy and snug in the ceiling. But darn it if they don't still pray for that dastardly (yet very cute) squirrel. Ah man! Great story! Glad I am not the King and Queen! 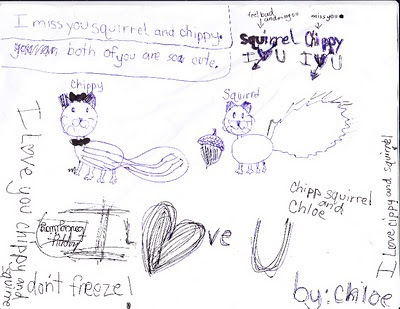 Love this post about that dastardly little Squirrel. I'm surprised that Joel didn't put him in the freezer to make his fur cold. I love how sweet your little girl's hearts are. But, I'd be a wicked witch too. I love your creative take on this exasperating situation. BATS!!!! I think that would freak me out a lot more than the squirrel. And, I'm excited to see your Christmas header (hint, hint). LOL. CLever post. This reminds me of our experiences with "cute mice" in NYC! Glad that evil triumphed. Oh, what a fun story!! Fiction, I'm sure (along with any status updates that may have been posted on facebook on the subject). You write excellent fairytales! So realistic! 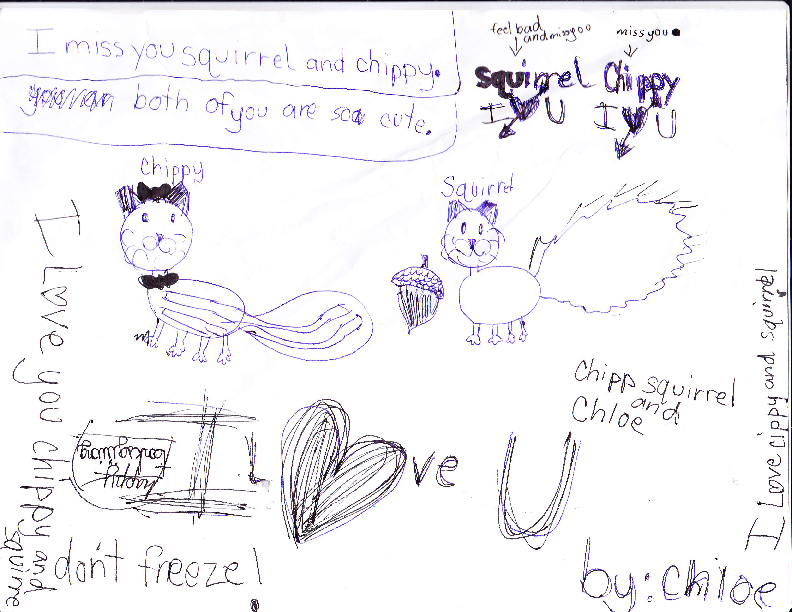 I kinda wish that squirrel was my pet. But I'm not a big fan of in-house pets so maybe that wouldn't work out so well. Yeah, the bats would have freaked me out the most. Except, the bats weren't making holes in the ceiling so that sort of makes the squirrel a bigger deal. Glad everything is fixed! We used to have flying squirrels try and nest in our chimney in my house growing up. Sometimes, they would get in the house and then there would be all kinds of crazy mayhem until we caught and released the little critters outside. Flying squirrels are pretty cute too. They look a lot like bats. But well, furry and cute and stuff. I'm glad that story ended well except for the part of paying for it to end well. and it's so true, if we are happy...that is a GOOD thing! The squirrel was bad enough, but BATS?! My BIL recently went through this but with a raccoon. Makes our little mice infestation of 2004 look like a cakewalk. Oh, SERIOUSLY. I mean, you just start trying to get a handle on things and then you have BATS and a SQUIRREL and you have to pay a fortune to get rid of them??? Sometimes life is just insane. You've, as usual, placed a darling and sweet spin on the nasty things life hands you. Way to go, Lara. I'll try to follow your example. Talk about darwinian survival of the fittest. Wishing you some holidays free of the scritchy-scratchy and some very happy princesses! very fun story! I love writing just like that! 2 Christmases ago I wrote a similar story about King and Queen and a trip we took to North Carolina to see our 2 grand daughters. We still laugh about the adventure to this day and it is so fun to read it in story tale form! Those darn critters! What about the bats?????? or is that another story?? We have this same problem! DASTARDLY indeed! But wait. Not the same...because ours hasn't made his way through to the room yet. I fear it though. Daily. It's terrifying. Oh wow; what a story.